Most diehard T-34 tans now know the story of how Factory No. 112 – “Krasnoye Sormovo” – got started in the T-34 business in 1941. 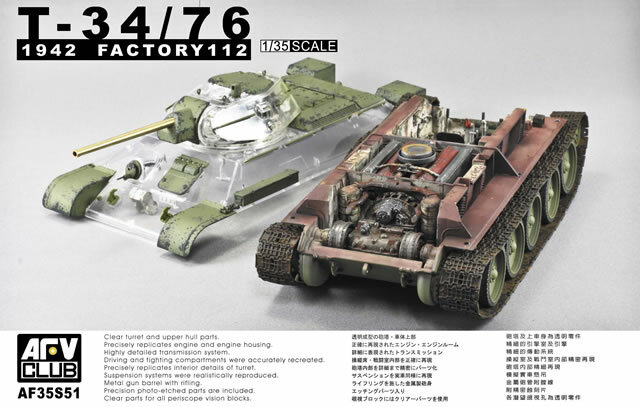 The second factory after the Stalingrad Tractor Factory to take up production, they began with knocked-down T-34 kits from Kharkov and began working on their own slightly modified design from that. Later, as they got into production, they modified the design of the Model 1941 tank to make it easier to produce, “notching” the front of the hull and glacis plate to fit together and adding handrails for “tankovyy desant” infantry everywhere that they could. 161 were built there in 1941 and by the time that “Krasnoye Sormovo” changed over to the product-improved Model 1942 – in 1943 – they had built more than 3,000 of this type. AFV Club has played it smart with some of their favorite features (which have not always been modelers’ favorites!) by using smart choices for a change. For example, the kit comes with 20 separate black tires for the road wheels; but unlike Academy, they have made theirs in styrene so there is no problem in cleaning them up, fitting them to the model or painting them. But like the Churchill kit before it, it comes with actual steel springs for the Christie suspension units; these seem much weaker and should be easier to install without 20 or more fingers. If installed carefully the complete suspension works. Detailing starts with the floor and moves forward. Separate details abound in the control (drivers’) compartment and include rodding for the foot pedals. Ammo racks are provided with only half a shell; however, since this cements to the ammo rack trays for single rounds, it is a smart way to ensure you can paint the round AND the rack with a minimum of grief. Seats are neatly done with separate thigh pads and even machine gun racks look the part. The V-2 engine is complete, but is one of the few areas in the model where AFV Club made a mistake. Somebody put the original 1940-early 1941 air cleaner (sort of like that from an older American car with a carburetor) on top of the engine (parts A31/A32) but then includes the later “cyclone” type air cleaners behind the transmission firewall. The latter are unfortunately necessary as the exhaust pipes attach to them on the way to the exhaust outlets in the rear of the hull. They also connect to nothing, so this will be tedious to fix. While the model comes with only the original pressed disk steel wheel with “notched” tires, there are three different options for the idlers and drivers (1940, 1941, 1942 and beyond). The kit suggests using B33/B37 for the idler and B9/B13 for the driver, but if you have good references you could probably use the B31/B35 and B15/B16 ones as well. The tracks are a bit thin and floppy, so most modelers may want to use an after-market set for this kit. I am not sure if AFV Club will offer single-link tracks although based on their past kits it seems a logical assumption. The upper hull, stern plate, turret halves, roof and turret ventilator are all molded in clear styrene. This is slightly marred by ejection pin marks on the inside of the rear fenders, the stern plate and the turret roof; removing them will take careful sanding, buffing and a touch-up with Future or Johnson’s Klear. Four finishing options come with the kit, three in 4BO green and one white: two from the 1st Tank Brigade, Polish 1st Army, Pomoroze 1941 (white 122 and white 238); 45th Tank Regiment “For Soviet Estonia”, Eastern Front 1943'; Unknown Unit, whitewash camouflage (Triangle red 6), spring 1943. Overall this is a super effort and other than the silly twin air cleaner option problem is a winner. From the parts breakdown AFV Club appears to have more T-34s planned for the future as well.